FORT WAYNE – It’s a phrase that has been shouted for years. 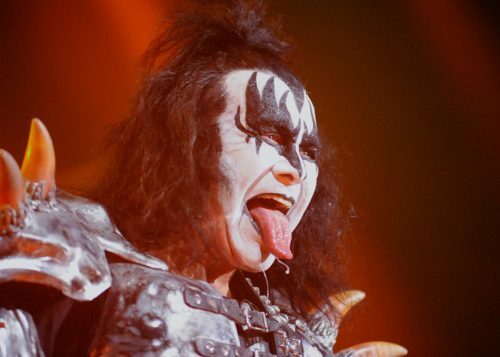 A familiar one to the Kiss Army, it’s a ritual much like the movements of a creature of the night. Only the towns and venues change. And with that, the gigantic 50-foot Kiss curtain dropped to the Allen County War Memorial Stadium floor and the pyrotechnics kicked in. 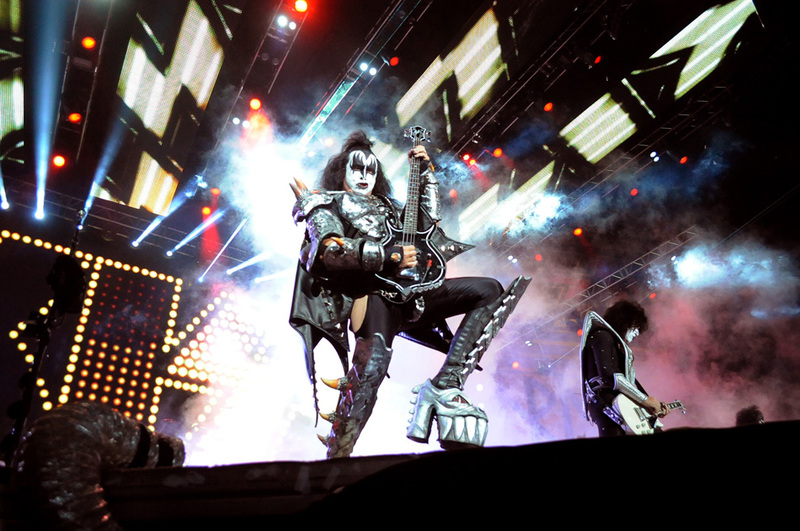 Kiss was in town for its Freedom To Rock Tour, and they weren’t messing around. 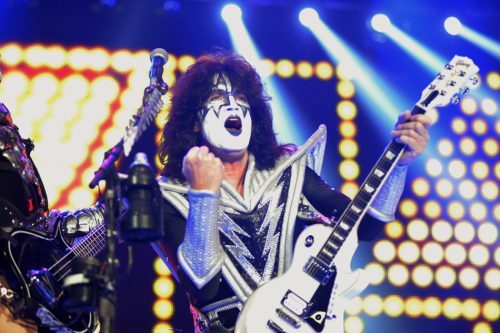 Playing Fort Wayne for the first time in nearly two decades, Kiss brought its entire arsenal with it. A sign in the crowd read it was someone’s 41st Kiss show. Whether or not that person was an original member of the Terre Haute movement led by Bill Starkey in the 1970s that became the Kiss Army, hard to tell. But the loyalists were out in full force in the nearly packed house. 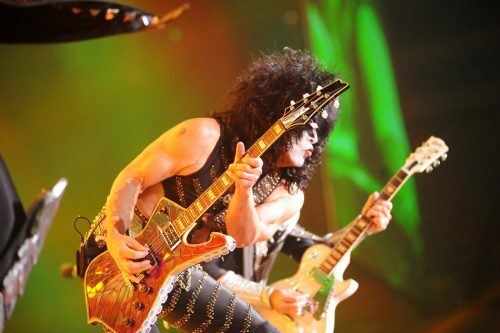 The show was vintage Kiss at its best. 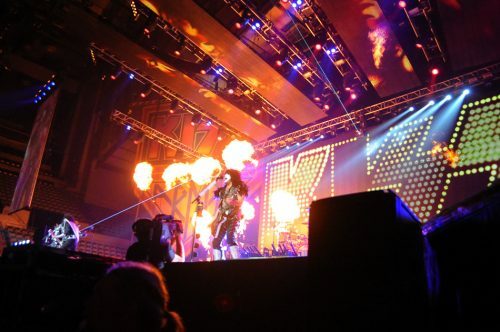 Opening with “Detroit Rock City”, all of the machismo and over-the-top stage presence that made Kiss one of the greatest stage shows on the planet wasn’t skimped or watered down just because the band is in its 43rd year of existence. 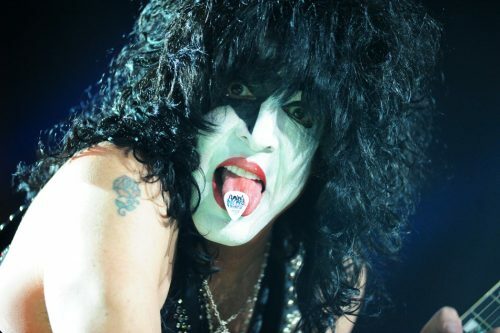 Lead singer Paul Stanley, one of the two founding members of the band along with bassist Gene Simmons, plus guitarist Tommy Thayer and drummer Eric Singer, continued to carry on the tradition of giving the fans their money’s worth. 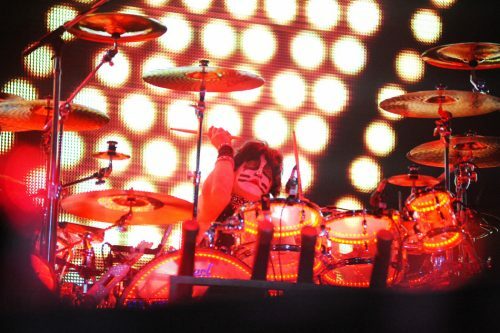 In a 2001 VH1 documentary on Kiss, “Beyond The Makeup”, Stanley noted the band was steadfast in its performance. “Nobody wants to go to the grocery story, pay a lot of money and get an empty sack.” That still resonates in the almost two hours of theatrics, and all four members get their own moment in the spotlight. In full costume and makeup that is the trademark of the Hall of Fame band. 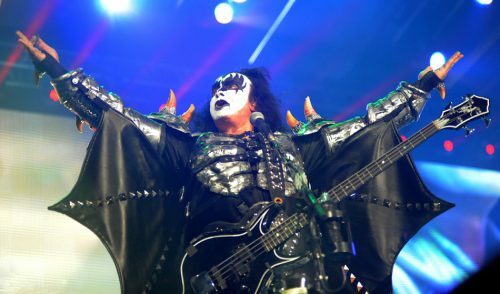 Simmons still does his demon routine, using his bass notes to draw out the blood, then rages into “God Of Thunder” high above the stage. Stanley asks for permission, then joins the crowd via a mere metal swing, flying across the floor to a raised stage to show everyone his “Love Gun”. Thayer uses a cleverly placed camera on the edge of his guitar and shows his chops on “Shock Me”, firing off several ‘lightning bolts’ as part of an abundant fireworks accompaniment. 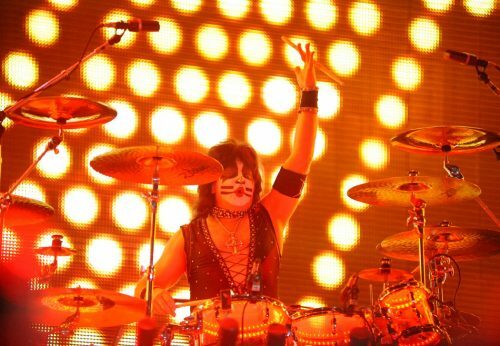 Singer got out from behind the kit to open the encore, in historic Kiss fashion, to sing “Beth” in almost a karaoke vibe. The band also brought forth some of its huge hits like “Shout It Out Loud”, “I Love It Loud”, “Lick It Up” and “Black Diamond”. As Simmons and Stanley have become known for, their philanthropic work was put into motion Friday night. 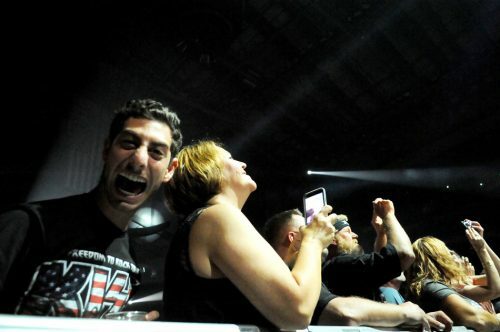 Bringing up some Hoosier military members and an honor guard, the band was credited with a donation from the show’s ticket sales to Wounded Warrior Projects. Stanley then led the crowd in the Pledge of Allegiance and the band careened into the “Star Spangled Banner” before closing the show with a rain of confetti and “Rock And Roll All Night”.